Which part of the muffin is the best? The muffin top! Imagine biting into sweet and tangy blueberries combined with heart healthy oats! Hmmmm! I am in Muffin Top heaven! 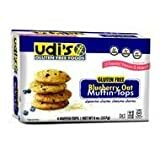 With Udi's Blueberry Oat Muffin-Tops you can now experience Muffin-Top Heaven whenever you'd like! These muffins tops are fortified with vitamins and loaded with antioxidants, delivering a powerhouse of nutrition with every bite! Thes delicious Blueberry Oat Muffin-Tops bring gluten free goodness to the whole family.